You and a guest are invited to join us and your fellow entrepreneurs for an evening of networking, Budweiser products courtesy of Gold Coast Eagle Distributing and delicious hors d'oeuvres by John Dough Bakery. You will also enjoy a special presentation by our guest speakers who will briefly discuss financial resources for entrepreneurs and small business owners, best practices and the new social media, and intellectual property protection. Best Practices & the New Social Media: Dan Miller, BizTank LLC and Neighborhood America. 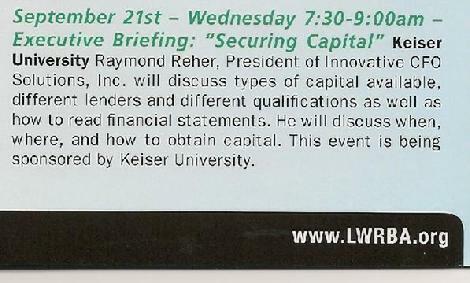 Wednesday, Jan. 28 � 8:30 a.m. to 12 p.m.
Seminar 8 - 10 a.m.
Speaker: Raymond A. Reher, Innovative CFO Solutions, Inc. Successfully managing cash flow is the single most important challenge faced by businesses today. Business owners need concrete strategies to deal with the challenges presented by today�s economy. This seminar will provide strategies and tactics for managing cash flow in today�s economy as well as the tools needed to dig deep into financial reporting systems to get needed data.